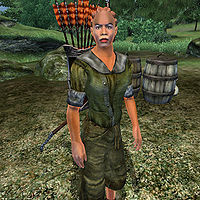 Mirisa is a Redguard hunter living at Crestbridge Camp near Cropsford in the Niben Bay area. She is extremely knowledgeable about goblin culture, and will explain a great deal about it during her related quest if asked. After the quest Goblin Trouble is complete, she will travel to the Imperial Bridge Inn on the banks of the Silverfish River. Mirisa wears lower class clothing: a green wool shirt, sack cloth pants and a pair of doeskin shoes. She is armed with a steel bow with steel arrows and a steel shortsword. She also carries a small amount of gold. Speaking to Mirisa for the first time will have her say: "Well met! Come, warm yourself by our fire." If you came to speak to her after agreeing to help Barthel Gernand will allow you to ask her about the goblins: "You've agreed to help them clear the goblins from Cropsford? That's great news! I've done some scouting around while we've been camped here, and it looks like Cropsford is right in the middle of a goblin war. The caves around here are infested with goblins. Normally goblins stay close to their lairs, and wouldn't be a huge problem. But two tribes are at war, and their war parties are crossing right through Cropsford. What you'll need to do is stop the war somehow." Asking her about the goblin war will have her say: "Goblins have their own reasons for doing things. Don't make sense to us, usually, but I've learned a lot about their ways over the years. Each tribe guards a head in its lair. Whose head, I don't know. A sacred tribal totem or something like that. Anyway, if you want to rile up a goblin tribe, steal their Tribal Head. Which is often what a rival tribe does, just to prove they're tougher. I'd lay odds that the war between the two tribes is because of a stolen Tribal Head. No other reason for a war to go on this long. So, to stop the war, all you need to do is sneak into Timberscar Cave, find the stolen Tribal Head, and return it to the Cracked Wood Cave goblins. Unless you want to do things the hard way..." You will then ask her what the hard way is, leading to Mirisa explaining what the more difficult option is: "Well, you could always just fight your way into Cracked Wood Cave and kill their shaman. Every goblin tribe is led by a shaman, but she mostly stays hidden in the heart of the lair. Well protected. But, kill the shaman and the tribe will dissolve into confusion. Most likely end the war." Asking her about the Goblin Lairs she mentioned will have Mirisa mark their locations on your map: "The two nearest are Timberscar Cave and Cracked Wood Cave. Here, I've marked them on your map. Unfortunately Cropsford is right in between them." Asking her about Cropsford will have her mark the location of Cropsford on your map as well: "Follow the Yellow Road northwest from here. You'll see the supplies they had to abandon when the goblins attacked." Ending this conversation at this point will have her offer one final piece of advice as you part ways: "Good luck. And don't underestimate the goblins. They're more dangerous than they look." Speaking to Mirisa again about the goblin war before resolving the conflict will have her remind you about what to do to complete your task: "Like I told you, there are only two ways to stop a goblin war. Either kill the attacking tribe's shaman, or recover the "tribal head" from the rival tribe, which is likely the cause of the war. Neither one sounds like a picnic to me." If you decide to resolve the conflict by killing the shaman of the Cracked Wood Cave goblin tribe, Mirisa will be pleased that you ended the war: "You killed the shaman of Cracked Wood Cave!? I'm impressed! Barthel Gernand will be glad to hear that." If you take the stolen tribal totem from the Timberscar Cave tribe, but don't bring the head to Mirisa as proof of the deed, Mirisa will refuse to tell Barthel that it is safe to return to Cropsford: "You say you took the head from the Timberscar Cave goblins? Where is it, then? I'd like to just believe you, but I can't send these people back to Cropsford unless I'm sure the goblin war is over. Show me the head, so I know it is safe for the settlers to return to Cropsford." If you retrieve the stolen tribal totem from the Timberscar Cave tribe, and bring it back to Mirisa as proof of your feat, Mirisa will be impressed at your accomplishment:"Amazing, you actually swiped the stolen head right out of Timberscar Cave? Ha, those goblins won't know what to think now! You don't really need to do anything else. The Cracked Wood tribe will stop attacking Timberscar Cave once they figure out the head is gone. Of course, now that you have the head, you could create all sorts of mischief." Asking Mirisa about what mischief you can cause with the head in your possession will have her give you an example of what you can do with the head: "Well, for instance, you could give it to any other goblin tribe. They'd boast about it just as if they won it in a war, and pretty soon the Cracked Wood tribe would launch a war against THEM. I'm not sure if the Cropsford settlers would be all too pleased about you stirring up a new goblin war, though." After you inform Barthel that the goblin war has ended Mirisa will thank you for ending the conflict if you ask her about the war again: "Good work ending the goblin war. The settlers are very pleased. I'm pretty impressed as well." If you run into Mirisa again after the Cropsford settlers have put up their first building, she will happily greet you by saying: "Hey, I was up in Cropsford the other day. It looks like they're really making a go of it. You did a good thing there, you know." A character with an identical name exists in Bloodmoon as an Imperial Cult missionary. Esta página foi modificada pela última vez à(s) 02h24min de 30 de dezembro de 2013.